I saw this on the Christian Grandparenting Network's site the other day and knew I wanted to share it with you. It is a great question, but has a very easy answer. Clearly one answer matters and one does not. 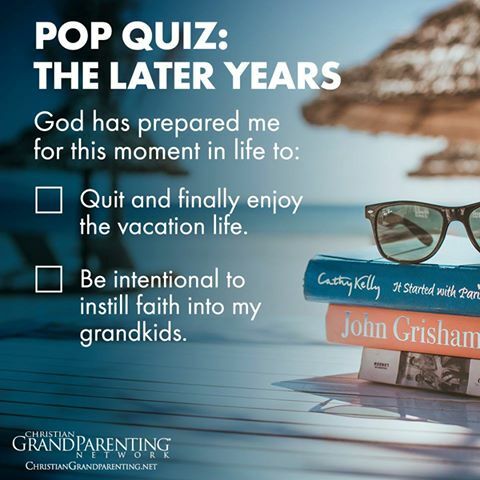 And, it is great fun when we are intentional to instill faith into our grandchildren! I love pointing my grandsons to God. We do science projects, have discussions and take time to pray together. I watch for opportunities to connect what is happening in our lives to God, His Word and His love for us. I can be intentional about having conversations with my sweet grandsons; and I am, but ultimately, the choice is theirs. So, when I am able to hear my grandsons talk about how their faith is growing, it makes my heart happy! The other day my grandsons were at my house and we were talking about prayer and how while the Bible tells us God always hears and answers our prayers, sometimes it may not feel like He does. Josiah (about to turn nine) said; "When it feels like God does not hear or answer our prayers, it really is just because He knows something we do not; because He really does hear ad answer our prayers!" Oh yes . . . it is easy to answer the question . . . one answer matters and one does not! Be intentional. Instill faith in your grandchildren . . . when you retire and before you retire as well.